These days, I see it all happening in slow motion, again and again. But when it occurred, the attack came so quickly and furiously that both my wife and I were simply stunned. 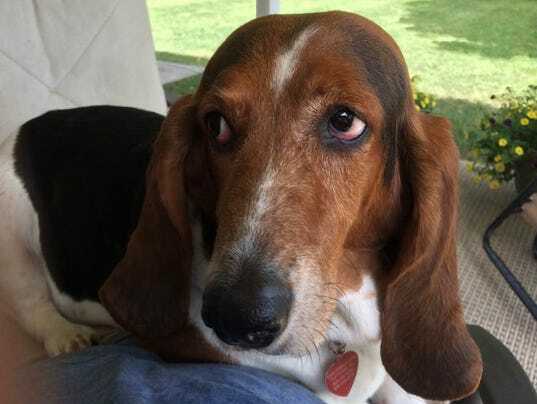 Looking back, it probably was just a couple of seconds of paralysis on our parts as the 100-pound, gray-and-white PIT BULL pulled his owner, a slightly built woman, to the ground, sprinted across the street and launched himself onto our basset hound's neck. When I snapped out of it, I kicked the pit bull in the face — to no effect. He got on our dog's neck and started viciously shaking back and forth. I kneed the dog and pushed it, also to no effect. In hindsight, I think the only thing that saved Molly was all the loose flesh bassets have around their necks, as well as her tough collar and her big ears. The pit could not get onto the meat of her neck. After what seemed like an eternity but was probably less than a minute, my wife and I, finally assisted by the husband of the woman who lost control of the dog, managed to pull their pit bull off Molly. I was lifting it by the harness, and I think that may have cut into his air supply. It was one of the few times I had no pepper spray on me, not that it would've worked — more about that later. This all happened in our neighborhood, a few blocks from home, late on a weekday afternoon. Immediately afterward, I was not nice with the owners about the attack, in part because this couple's other pit bull, who weighs about 120 pounds, had gotten loose one night about a year and a half ago and harassed my two bassets to the point where I had to pepper spray him. That pit bull, simply put, is a terrifying looking dog, with a head the size of a good-sized skillet and shoulders like a man's. "He's a boxer! He's a boxer!" Folks, if that dog is a boxer, so am I. I know some of you have a deep and abiding love for pit bulls, but I do not. I've written repeatedly about how dangerous the breed is, usually after a death or tragic mauling in our area, and to be honest, I'm sick of these owners making excuses for them and telling me how loving and sweet they really are. They are, as I've said many times, sweet and loving — until they're not. • From 2005-2017, pit bulls mauled to death 284 Americans, about one citizen every 16.7 days. • Pit bull breeds were more than 2.5 times as likely as other breeds to bite in multiple anatomical locations. • Attacks by pit bulls are associated with higher morbidity rates, higher hospital charges and a higher risk of death than are attacks by other breeds of dogs. • In 2017, family dogs inflicted 72 percent of all dog bite fatalities. Family pit bulls were responsible for 64 percent of these deaths. Folks, the stats go on and on and on. I'm tired of the apologists claiming the dogs attacking are not pit bulls because they're mixed breeds, or they're not any more dangerous than any other dog. It's like arguing that a BB gun will inflict the same damage as a shotgun. In our case, we were lucky. The veterinarian told us we were lucky Molly wasn't killed. Molly had abrasions on her neck, but no puncture wounds. I'm happy about this, but one negative aspect of the injuries is that she apparently was not hurt badly enough for the pit bull to be declared a "dangerous animal" under the Town of Fletcher ordinances or Henderson County's ordinances. .I spoke with three police officers for this column, and all three assured me the only thing that will stop an attacking pit bull is, to be blunt, A BULLET TO THE HEAD. One used those exact words.To be clear, generally speaking you cannot shoot a dog that's attacking you if it's on its owner's property, or if it's a police dog or hunting dog doing its duties. But if you're in public, or on your own property, and you believe your life or property, including your dog, is threatened, you can protect yourself, police told me. "I would submit to you, with the number of deaths attributed to pit bull-type dogs, I feel you would be justified in using whatever force necessary to protect your life and your well-being and that of anybody with you," said Major Frank Stout of the Henderson County Sheriff's Office. "I've seen too many maimings and deaths of both adults and children. You have to be extremely careful when dealing with this breed. "Our veterinarian told my wife about a pit bull he'd treated years ago for a shotgun wound to the back, inflicted by its owner because the dog would not release the leg of the horse it was bringing down. You read that right — it was trying to kill a horse. Despite the vet's warnings, the couple wanted the dog stitched up, because, you know, he was really a sweetheart. Months later they came back and asked for the dog to be euthanized because it had shredded the woman's arm. Henderson County Sheriff’s Office Sgt. Paul Blackwell, who works in the Animal Control division, told me about a recent case he worked in which a pit bull nearly killed a grown man. "I can show you pictures of a pit bull, much smaller than the one you're talking about — maybe 50-65 pounds — it ate a man up," Blackwell said. "Broke his arm. Ate his legs up. There was so much blood when we got there — he was already gone; the ambulance had taken him away — it looked like a slaughterhouse. "The man survived but has a long recovery ahead. Blackwell said he is not "anti-pit bull," and he maintains that some of the meanest, most dangerous dogs he's seen have actually been Labradors. He's also declared a dachshund a "dangerous animal" because of its biting prowess. But he also told me about another case he worked recently in which two pit bulls started fighting and were locked up. He pepper sprayed them both in the mouth, nose and eyes, to no avail. When I asked him what to do in the case of a pit bull attacking my dog in the future, he had a blunt response: "Shoot it in the head." Honestly, I favor pepper spray, but I also want my animals, and us, to stay alive. Blackwell knows how ardent pit bull admirers are, and he stressed that he does not assume all pits are dangerous. "In all fairness, I can show you some pit bulls who are very loving and sweet," he said. Still, pit bulls become much more dangerous than other breeds when they go off, because of their physical traits. "Some of small ones are extremely strong, and they have an extreme bite pressure," Blackwell said. "Pit bulls remind me of alligators — when they latch on, they hold and they shake. When you see any dog grab on to something and shake, it’s trying to kill it. "This is exactly what the pit bull did to Molly, and without the intervention of three people, I have no doubt he would have killed her. Still, the dog has not been declared "dangerous," which as I said would come with a host of restrictions on the owners. Such a designation is up to the police chief in Fletcher, but other than a dog that actually killed a person, the criteria for a "dangerous" dog designation in the town's ordinances seem nebulous at best to me. I'm hoping they'll look more closely at their ordinance and make adjustments. Rest assured, I'll keep pushing them on this. That's because I have no doubt this dog will attack again. I just hope and pray it's not a child, and that it's not fatal. This is the opinion of John Boyle. Contact him at 828-232-5847 or jboyle@citizen-times.com located in Ashville NC. When a pit bull tries to kill something, it should be euthanized immediately. The dangerous dog label should apply from the onset, not after it goes into pit mode. We are dealing with dogs that kill, and treating them like Poodles. The bloodshed will not stop until we get serious. I hope Mr. Boyle is prepared for what's sure to come from the pit fanatics. They are going to threaten him and stalk him. They are sick people. I talked with a pitty lover the other day, and she was quite aware of pitbulls attacking without provocation. To her, it's just a breed trait. Keeping one of these dogs is fine with me if it ONLY mauls or kills its owner. The dog needs to be restricted from mauling other people and animals. That's some loose wiring right there. Explosive attacks for no reason that do such horrific damage, yes, it is a breed trait, but why would you want to live with that unless you had a death wish? HOUSTON TX - A NEIGHBOR'S 2 DOGS "SOMEHOW GOT LOOSE" AND INVADED AN 82-YEAR-OLD WOMAN'S BACKYARD KILLING HER CAT ...SHE WAS INJURED TRYING TO SAVE HER PET! ROBESON COUNTY NC - A FAMILY FRIEND'S DOBERMAN MAULED A 1-YEAR-OLD BOY ..."WHEN IT WAS LET OUT OF THE OWNER'S REACH TO STRETCH AND BEGAN PLAYING WITH THE CHILD" ...AND WITH MANY ADULTS/PARENTS AROUND! SANDY UT - A "RESPONSIBLE PIT OWNER" LET HIS MEAT GRINDER RUN UNLEASHED AT THE DIMPLE DELL RECREATION AREA SO IT FOUND SOMETHING TO TRY AND KILL... TWO HORSES!!! SHAMOKIN PA - A BOYFRIEND'S "LARGE" PIT/AMERICAN BULLDOG DRAGGED HIS GIRLFRIEND BY HER HAIR ONTO THE PORCH AND MAULED HER LEGS AND ARMS RELENTLESSLY ...OFFICERS TRIED EVERYTHING THEY HAD ON IT SO THEY FINALLY SHOT THE MONSTER!! !